Dragodon pictured on Chronicles wallpaper. 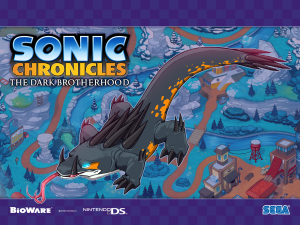 Dragodons are enemies faced by Sonic and team in Sonic Chronicles: The Dark Brotherhood. Found beside the chilly rivers of the Blue Ridge Zone, the creatures are large, four-legged reptiles, resembling giant monitor lizards. The creatures have Organic (ground) elemental susceptibilities, rendering them weak against fire, ice, electric, and earth, while resistant to water and wind. Dragodons always attack in pairs; they have 150 HP and their POW moves are Regenerate and Tailswipe. Proper Dragodons appear only in Blue Ridge Zone, although the team has to fight a holographic projection of one on the Zoah Colony: Haniman's "Night Stalker".